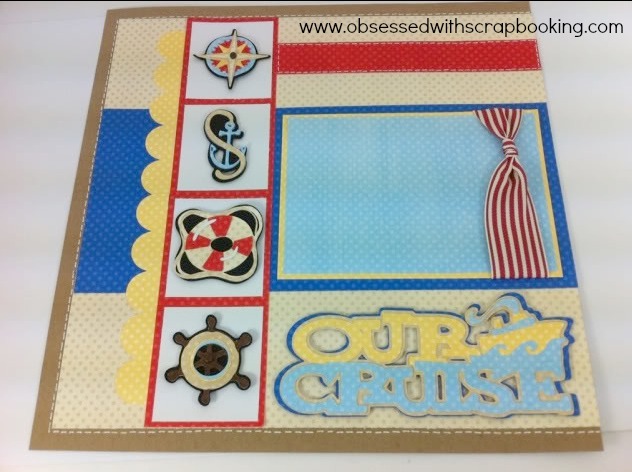 Obsessed with Scrapbooking: Cricut Pack Your Bags Cruise Layout-2 versions! Cricut Pack Your Bags Cruise Layout-2 versions! Here is the more traditional colored version of the layout I taught on the Cricut Cruise a few years ago. This layout was made using the Cricut Pack Your Bags Cricut cartridge and the Martha Stewart All Occasions Cake Cricut cartridge and Bo Bunny Double Dot cardstock. I love how the double dot paper gives some interest and texture without being overwhelming. Here on the left side of the page, the four nautical shapes are cut at 2" each and have multi-layers. They are all shadowed with black to give them some anchoring. To really make a statement, be sure and cut all the layers - your die cuts really shine that way. The "Our Cruise" is cut at 2-1/2", all layers also. The scalloped border is from the Martha Stewart All Occasions cartridge and cut at 10". On the right hand side, I cut the ship at 5", after flipping it so it faced into the layout. The journaling block was cut at 4", 3-3/4" and 3-1/2". All photo blocks are for standard 4" x 6" photos. White pen adds some faux stitching around the edges. The papers are from the Cricut Imagine cartridge, Berries and Cream Patterns and Colors. I love the tropical feel to this. The papers are just fabulous. See how different things look with other colors? Makes such a difference! I think depending on what type of cruise you went on (Alaska versus Caribbean, etc. ), each layout has a place. 1) Leave a comment below - Which layout do you like better - traditional primary colors or tropical colors? Winner will be announced on Sunday, July 21, 2013 and has two weeks to claim prize. Allow 2-4 weeks to receive. This post may contain affiliate links for my diet coke intake needed to produce this blog! Both are so cute...love the tropical colours!! Since I have to choose between the two cute layouts I am going to go with the traditional one. Love them both. Oh Joy, I really this layout. You did a great job. Hard to choose but the traditional is bolder. Thanks for the opportunity to win. Tough question. I really like the traditional colors, but then the tropical colors give it whole other vibe. I think both would be great depending on the cruise. Thank you for sharing and for the chance to win this great cartridge! I love the tropical colors the best!! Both layouts are great, but I am so loving the nautical trend right now so have to say my favorite is the traditional one. I love both layouts,but if I had to pick a favorite it would have to be the traditional. It really reminds me oa a cruise. I love your LOs!! So cute, I need to make my LO as cute as yours!!! TFS! They are both fantastic. But the red white and blue of the traditional just scream cruise to me. I love both color schemes! We went to Alaska on our cruise so I would use the traditional colors. But if I were to go to a tropical location I would definitely use the other color scheme. You always amaze me, thank you for sharing. Great color change for a whole new look! I love both, but since my last cruise was south ill be using bright colors. Thanks so much for the ideas and chance to win an amazing prize, Dallas. I really like that layout and how it can be used for multiple things. What a great layout! Now I need to go on a cruise so that I can use it!!! :) I love them both, but the tropical colors would be great for a tropical cruise so I choose it! I am a traditional girl plus the traditional colors look like Disney colors and I needed some new ideas for our two Disney cruises. Will have to look at getting that cart! Thanks for the idea!! Oh Joy what great LO's you really do an awesome job with your scrapbooking I'm so glad you did these. I am submitting a request: I would love for you to do more LO's you truly are so talented at this. Well you are extremely talented at everything hmmm you know what I mean. I love everything you do you truly bring so much "JOY" into my life. I like the tropical layout! Great layout! Thanks! Love the tropical one the best. Wish that would have been on a cruise when I went. They only had a shoe box of construction paper and a few dried up glue bottles. It is hard to choose. I like the bold primary colors (Caribbean Cruise) and the softness of the pastels (Hawaii Cruise). I guess I will have to go with the bold primary colors. Both are cute, but I am loving the tropical colors! I absolutely love both versions!! If I had to pick I would go with the primary colors! Love the original bold colored version...but the softer colors are a nice change of pace! Joy love the cruise layout, it's amazing how the same layout can look totally different by changing colors! Well now all I need is to go on that cruise! Both are just so cute! I am more into traditional colors but the tropical colors really pop for this lo. Both are great! Like you said, just depends on the type of cruise you take. Love them! Both layouts are great! I think the colors you use depend on the colors in your pictures. That is how I decide what papers to use anyway. Your layouts are fabulous. I have this cartridge and appreciate your creations since they give me great ideas. I really like the traditional primary colors. This is such a fun layout. I just love those little "curtains." I prefer the more tropical look. It seems that most cruises go to tropical locations. However, the primary colored layout would be great for an Alaskan cruise. Nice job on both. Thanks for the inspiration. The tropical colours for me although I'm going to have to go on a cruise now to get to use these ideas :-) Although there are plenty of excuses to use ribbon in a layout but your idea of the curtains look is fab! I love both layouts but I like the tropical colors better. Gotta vote for the primary colors - truly nautical and introduces the cruise theme instantly. Thanks for the chance to win! We took a cruise this past March, and I'm still working through our photos - love both pages! I think I'm generally more partial to primary colors though, so I'd have to go with that one. Thanks for the inspiration! love the tropical colors, it is just so different!!! Love the traditional one! Very nautical. I do not have a preference about colors....whatever suits the need at the time. I like them both, but if I had to choose I would say the tropical colors. Thanks for the great ideas. My son took me to Hawaii for a Mother's Day long weekend, so my eyes go directly to the tropical one. Great colors and will work perfectly when I scrap my Hawaiian pics. Thanks for the great giveaway. I normally gravitate toward the primary colors but really like the feel of the berries and cream papers... they do give the layout a real tropical feel!! I usually go for the tropical colors when thinking of a cruise but love the primary. I use the primary most of the time but never use them for cruises - always went for the tropical. Next time will use primary. Ohhhhh, so hard to choose but I think the primary colors have that nautical feel and really pop. Thanks for the wonderful inspiration and the chance to win. I thought I really liked the tropical one best, but I took another look and decided I like the primary colors best, its more nautical! 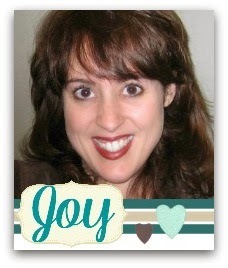 Thanks Joy, Very Cute layout- I like scrapping with dark colors, However the berry colors feel tropical. I mix and match depending on the pictures. My favorite is the traditional but both are cute. I love the tropical version best. I love BoBunny's double dot paper, but I don't like cards and layouts that have too much of it -- it makes me cross-eyed! To me, the double dot looks better when mixed with patterned papers and plain cardstock. Can't really say which I like best. They are both great. Really good work. Very Nice, Like the brighter layout; it's refreshing. I like the tropical colors best. I think I like the tropical layout better, I think it's the colors and the embellishments. They are both nice but I am attracted the that one. All though on the traditional one looks more nautical. I am torn, ok I like them both. What can I say I am a blonde! I like the primary colors, exciting very much like the cruise! I have to say it depends which type of layout I am doing. If they are vacation pictures of our trips to Hawaii it must be in bright colors, however if I am doing wedding layouts I like the pastel or even black/white/gray tones. Love this layout! Thanks for sharing with us! The tropical colors are eye-catching but I still prefer the tried & true traditional primary color layout. They are both great. Really good work. I love this layout - it inspires me to do one on our one cruise - now I just need to win the cartridge! I really love the tropical colors. I love love both layouts !! But the one that stood out and captured my attention was the one done in tropical colors !! Love love it !! Your layouts are fabulous. Thanks for a chance to win. Both versions are very nice and definitely give a different feel. I preference is the traditional. I LOVE the tropical, never thought of using those colors for a cruise, but it's great! I think it depends on where the cruise went. The first is more nautical looking and the second is more tropical. I'd go according to the itinerary. I love the layout - the traditional colors are my favorite - love the ribbon treatment. Thanks for sharing. Ahoy!! I live on Harsens Island in Lake St. Clair and I just have to go with traditional reds & blues. But if I lived in the tropics, I'd do the pinks!! You are so creative! I like the traditional colours! I love the tropical colors! Makes me think of my wedding and honeymoon in Hawaii 8 years ago! I really like the whole layout of both of them but as far as the colors I like the one with the traditional colors the best. Just seems to look the best. :-) You do such a good job on your layouts and they're so creative. Thanks for the ideas! I like the primary colours! Thanks so much for the chance to win. I would absolutely love to win this cartridge! I actually like both layouts, the die cut title with the ship makes the 2 page spread work in either color scheme. I love both layouts! I'm not sure I could pick a favorite. As you mentioned, the bright colors work well for a tropical cruise and the traditional for other type cruises. And I love how you chose different die cuts for each style. TFS! I love all of these colors and layouts...they are both uber cute!! I love everything you do and the different ways you show it can be done. Thanks for the chance to win this cool giveaway..i would love it..you are the best! ! Thanks so much! !! I guess I prefer the pastel colors a little more than the primary colors. I love the vibrant primary traditional colors best for this layout. Love tropical colors! Thanks for sharing! I like the primary colors! Very nautical! both are cute, but i prefer the primary colors better. Both versions are great and it is exactly like you said, depends on where you are cruising to. Enjoy your posts and creations. Usually, I like the boldness of the primary colors but the tropical colors seem to go better with the mood of the pages. Another great layout! Thank-you for the great ideas! Both are great LO's but I love the traditional colors. Loving the tropical colors, so perfect for a summer cruise!!! Beautiful layout! Thanks for sharing! love the primary color layout. not only are the colors great, but the simple layout is fantastic. 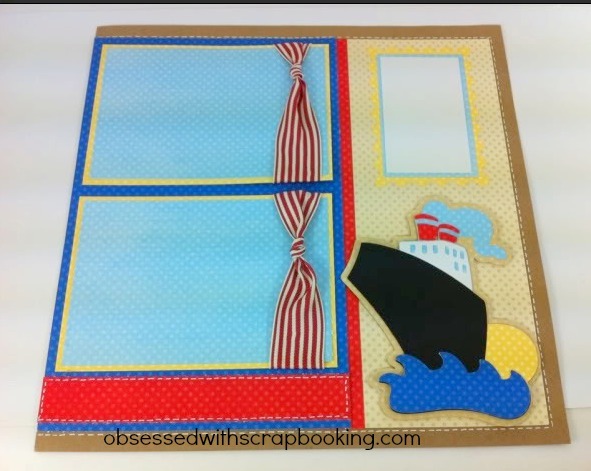 Although I have never been on a cruise there are many usable cuts to do a lot of different themed pages as well as cards. I have been looking at this cartridge to buy, I would love to win this cartridge. I just love this layout!! So fun and so very easy to change the theme to make it work for any project. I am partial to bold, primary colours. Love the dots!! Oh wow, both layouts look great! I'm not so much into primary generally, but this layout is great! I guess based on which colors I would scrap with, I would have to pick the tropical colors. Thanks for the chance to win! Hi, Joy. This question is hard to pick which one that I like the most. But I can say I like them both but in different ways the tropical layout would be great for me and my husband and the other layout with the dark color would work out great for a family cruise. Thank you for sharing this great layouts today. I prefer the brighter, more traditional colors. Thanks for a chance to win. I like both but my favorite is the traditional primary colors. as they are so bright! Considering I was on the 2011 Cricut Cruise with you as you showed us how to put the layouts together, I would have to say the tropical colors are my favorite!!! 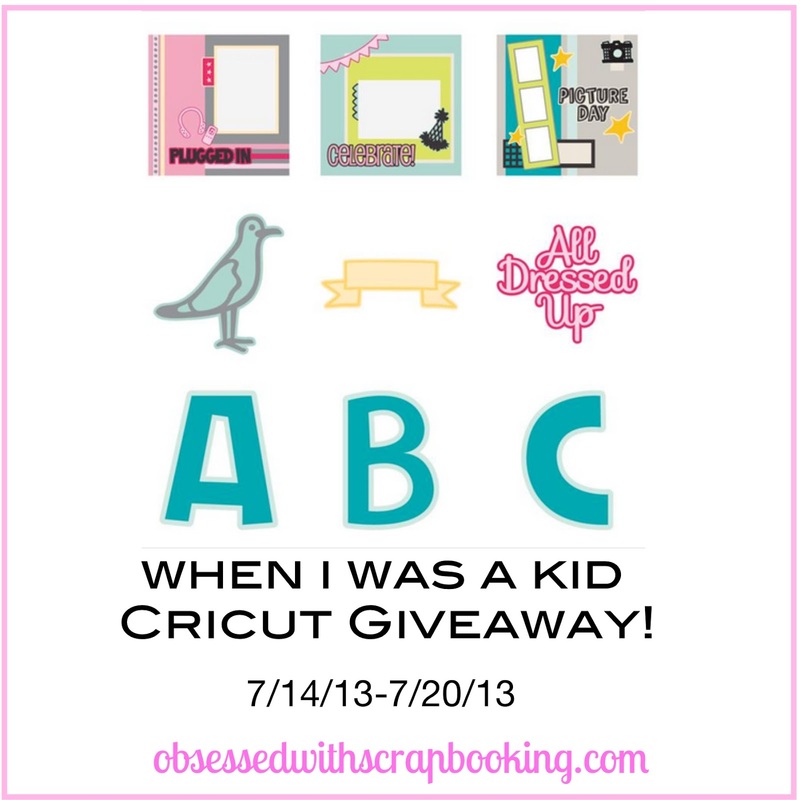 The layout is beautiful and holds sentimental value for me as a winner of the 2011 Cricut Cruise. I loved the Berries and Cream so much, I bought the Imagine and the cartridge! Meeting you and Brian on the cruise was a highlight of the trip for my niece Dawn and I. So glad to keep in touch through your blog and facebook. I really like both but do lean towards the tropical colors. Thank you for the great ideas! I especially like the layout with tropical colors! Thanks for sharing and thank you for the chance to win! While both layouts are very nice, I am a fan of the tropical colors. The tropical colors just screams "Jammin Mon" and it makes me smile. I reminds me of the ports of call on my cruise. They are both awesome but if I can only pick one, I'll pick the traditional one with the primary colors. Thanks for the ideas! I love both of them, maybe the tropical one more. Great layout!! Love that cartridge but thought I wouldn't get it due to never going on cruises! Maybe sometime in the future!! Tropical definitely. I can feel the ocean breeze and smell the salty water. Tropical and I am right in the middle of scrapping my cruise. Love the tropical and would love to win. Thanks for the opportunity. I like the primary colors because I have two boys and I dont really think they would like to have there pictures with pink ribbon. They are both really nice and I love the layout, thank you! I like both layouts but my favorite is the original. I love the tropical feel and the colors. I like the tropical ones....but ....I Really like them both very much!!! I WOULD LOVE TO WIN THIS I love the colors on here and the inspiration. I love the tropical layout. Thanks for the chance to win. Both of your layouts are terrific, but I think I like the primary colors the most. 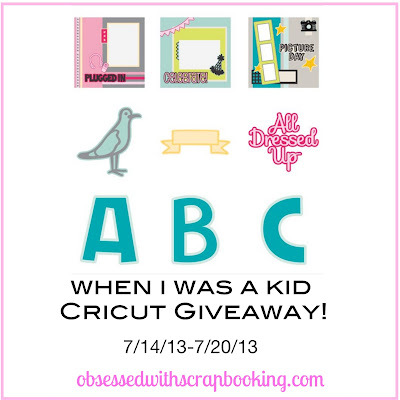 Thanks for the chance to win a new Cricut cartridge! Nice layout. I'll have to go with the traditional primary color one. Good job! tropical color is my fav!! Both layouts have a distinct look but I think I prefer the tropical colors. I like bright and colorful. I might case this for our Wedding cruise scrapbook layout! Hmm, tough question, but if I have to choose, I'd pick the traditional colors. They just ring true for the subject a little more than the other. I love the tropical colors!!!! I chose the tropical layout- if you are sailing to the Caribbean that is the tropics and why not reflect the colors? Lovely! I like both of them but if I had to chose one it would be the tropical colors and that is because I am more of a tropical color person!! Oh my gosh seriously we have to choose? Okay then I choose the primary one. I like how the polka dots make the pages pop. TFS. Love them both, but the traditional colors are my favorite for this layout. Normally I like the tropical colors but traditional just seems bright and fun for this theme! Wish I'd been on that cruise! What a great double layout. I love the layouts! I would choose primary colors. I have always been a big fan of the dotted paper. I guess I like the traditional one best - but both are awesome! thanks for the ideas! On this Layout I like the traditional colors. Love the dotted paper! I'm more partial to the primary colors, but it would depend on the colors in your pics to me. Great job! Since I'm getting ready to go on an Alaskan Cruise I would choose the traditional, however if I were going on a Caribbean Cruise I would choose the tropical colors. Love the dotted paper. Love both versions - but if I had to choose one guess it would have to be the traditional. Love those bright blues. Great LO, I like the newer version best, TFS, have a wonderful weekend! I think both color sets would work. I love and prefer the tropical colors. Since our last cruise was to Hawaii, I think that would be great to scrap lift. Thank you! I love both layouts! Wish I was going on a cruise sometime soon so I could make one of the layouts. I love the tropical colors and would love to win thank you for the opportunity to win. ruth at lake in Texas. Love them both. The traditional primary colors would be great for a boys page and the tropical colors would be great for a girls page. The best of both layouts! Meant to add a question to my comment above: there's no way to "flip" a cut on a regular small cricut cutter, is there? that's the only machine I have, but my friend has an expression and some software so that she does her cuts from her laptop. Would I have to try and get her to cut it for me or can I "flip" it myself? thanks for letting me know! I live in Florida, so the tropical colors call to me more, but I like the traditional one too. It goes with the Disney ships more also...lol. Always a Disney addict! The pages are really well laid out, and with room to add more than one photo per page, they're practical too. I'd LOVE to win this cartridge to start my cricut 'library'. I just got started with it and only have one cartridge and the weekly CCR offerings. I sure appreciate those, I can tell you! 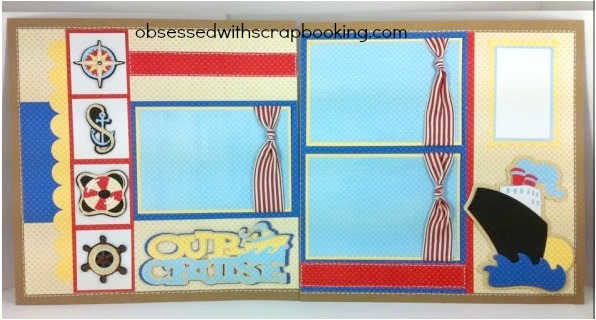 Love your cruise layout - wish I was going on a cruise so I could do it!! I love the tropical layout. We are taking our first cruise next year to celebrate my daughters 15 th birthday and this cartridge will come in handy as we are taking a Caribbean cruise. I would love to win !! My daughter and grandbaby are going on a cruise. Thanks for such wonderful ideas. This layout will be great for a book for Miss Bentley. The new cartridge will be great making scrape books for her.